Shape and size is ideal for all the family's laundry. Shirt buttons, zippers, etc. press down into the padding of the board, embroidery has never looked so good! Minimises heat radiation - cooler for the user. 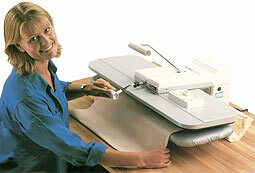 Makes ironing sheets and tablecloths so simple. Our presses use very little energy, about the same as a normal iron thanks to its special heating plate. Dry Fast Press Instruction book. From cotton to silk, from yokes to shaped parts, the last time you saw the garment looking this good was when you bought it brand new! Fastpress is perfect for pressing intricate, detailed items and makes short work of awkward corners and tucks. Fastpress handles tough denim in a jiffy. One light touch presses both sides at once without the shine from a hand-held iron. A professional "dry cleaners finish" in half the time without the cost! Give them back that brand new "just out of the packet" look every time! T-shirts are done in a flash with Fastpress. 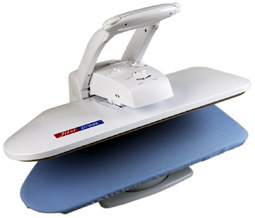 You'll be amazed how quickly Fastpress deals with sheets, tablecloths, napkins, etc, the largest items can be folded into the ample space at the back of the board.